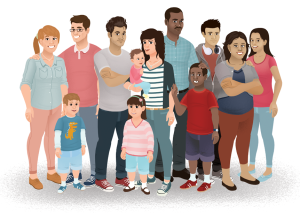 We are a team of registered professionals within the National Health Service in the UK, working with practitioners and parents to develop new resources to support all of us to have a happier life. We are a ‘not for profit’ organisation. We have been going since the late nineties. Ourplace is the gateway into online courses for you as a parent, grandparent or carer, courses that aim to support you in the most difficult job in the world! We know it works because parents tell us how much more they are enjoying their family life. There are 3 online courses. The first is an antenatal course developed by Registered Midwives and health professionals and called ‘Understanding pregnancy, labour, birth and your baby‘ and does what it says in the title! Information about giving birth plus learning about the baby’s brain and how to optimise your relationship with the baby. The second is a postnatal course ‘Understanding your baby‘. It was developed by health visitors and clinical psychologists, and other health professionals and is for parents of babies from 0 to 12 months. The third is for parents of children aged between 6 months and 18 years: ‘Understanding your child‘. This was also developed by child psychologists and specialist health and education professionals. We select only the best material that is based upon expert and credible research. Our courses were the first to receive the Government’s CANparent Quality Mark. We are the Solihull Approach team and we train practitioners all over the UK and beyond. A bit in brief: Using Ourplace and accessing downloads is free. We charge for the courses because we receive no funding and we need to cover costs. We don’t have adverts on the site and we don’t share your data. You will not receive any marketing materials. Your account resumes the course where you last left it. We will very occasionally email you with information about updates.